A small team of researchers at Carnegie Mellon University have come up with a tool that allows newbies and experts to design customized robots that can use 3D-printed parts and off-the-shelf actuators. The program has a drag-and-drop interface that allows users to choose from a small library of components and place them into the design. The system gives visual color-coded suggestions about possible placement or connections for a selected module and then snaps the module into place when it's dragged near a suggestion. Structural components can be automatically brought up to connect the various actuators. And modules can also be copied and pasted for rapid prototyping on the screen. 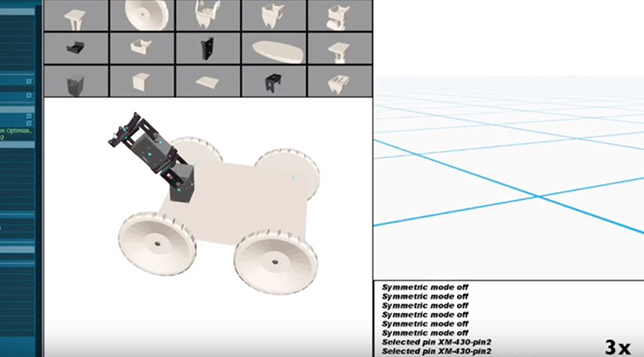 Once the design is done, a simulation feature allows the user to watch how the robot moves (or not) before the 3D-printing or building process begin. "The process of creating new robotic systems today is notoriously challenging, time-consuming and resource-intensive," said Stelian Coros, assistant professor of robotics, in a press release. "In the not-so-distant future, however, robots will be part of the fabric of daily life and more people — not just roboticists — will want to customize robots. This type of interactive design tool would make this possible for just about anybody." During the recent IEEE International Conference on Robotics and Automation, which took place in Singapore, project details were shared by robotics Ph.D. student Ruta Desai. The group has used the tool to design several robots, including a wheeled robot with an arm that can hold a pen for drawing and a four-legged puppy robot that can walk forward or sideways. Desai noted that the program simplifies the process of testing various body proportions and motor configurations to test how different options affect the robot's capabilities. "For instance, we discovered in simulation that some of our preliminary designs for the puppy enabled it to only walk forward, not sideways," she said. "We corrected that for the final design. The motions of the robot we actually built matched the desired motion we demonstrated in simulation very well." Coros said he believes that the work will make robotics "more accessible to casual users." That's an important aspect as robots become integrated into daily life, he added. "People who play an active role in creating robotic devices for their own use are more likely to have positive feelings and higher quality interactions with them." The work was supported by funding from the National Science Foundation.